Our balloon flights are available from a number of sites across Oxfordshire and also Buckinghamshire. These include balloon rides from the City of Oxford, sites in and around Henley on Thames and balloon flights from Great Missenden. Our local balloon crews have a great knowledge so that whichever of these areas you choose to fly from you will have an enjoyable balloon ride. For our hot air balloon rides from Oxford over the west of Oxfordshire we will launch from Cutteslowe Park, Harbord Road, Oxford, Oxfordshire OX2 8LH which is a large council run recreation area. From the opposite end of Oxford we provide balloon rides from Henley and the surrounding area. Where possible we will launch from our site at Swiss Farm, Marlow Road, Henley-on-Thames, Oxfordshire RG9 2HY. On some occasions if the wind direction requires it and in order to keep out of Heathrow Airspace we may use other sites at Wallingford or nearby Reading and fly back towards the Henley area for landing. 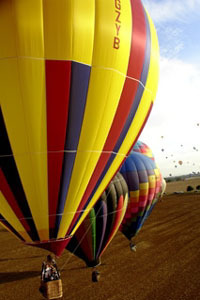 Our hot air balloon rides over the Buckinghamshire area will usually start from the Black Horse Pub, Aylesbury Road, Great Missenden, Buckinghamshire, HP16 9AX. However sometimes if the wind is stronger but still safe for ballooning we take off from our launch site at the Quainton Railway Centre, not far from Aylesbury and approximately ten miles north of Great Missenden. For postal enquiries you can write to us at our head office Altitude Balloons, Winchfield Park, London Road, Hartley Wintney, Hampshire RG27 8HY. Altitude Balloons is a trading name of Adventure Balloons Ltd and you can click here for more information about our balloon rides throughout the South East of England.